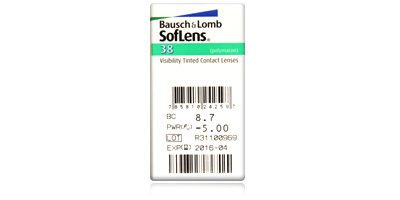 Manufactured by established optical brand Bausch & Lomb, Soflens 38 monthly disposables feature a super thin design and a material particularly effective at resisting deposit build-up. Designed with exceptional comfort in mind, these contact lenses stay in position on the eye all day and feel so natural you won't notice you're wearing them. These lenses are recommended for wearers in their 20s and 30s. 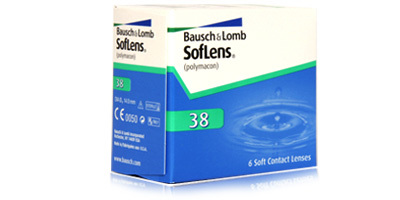 Six lenses are included in each box, making Soflens 38 monthly disposables excellent value for money. 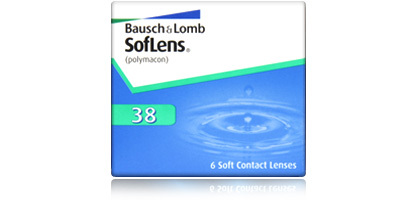 Soflens 38 are made from a particularly soft and porous material called polymacon. In addition to effectively resisting the protein and debris deposits that can lead to blurred vision and irritation, this moisture-rich substance helps keep eyes healthy and hydrated all day. The visible tint makes these monthly disposable contact lenses easy to see and handle, in and out of saline solution. Application is simple, fast and painless thanks to an inverse indicator. This handy feature clearly illustrates both sides of the lens so you can avoid the discomfort of applying your contact lenses inside-out and insert them correctly on the first go, every day. Soflens 38 can be worn daily for up to 30 days on a monthly replacement basis and are suitable for extended wear of six nights and seven days, subject to approval from your optician. Need advice? 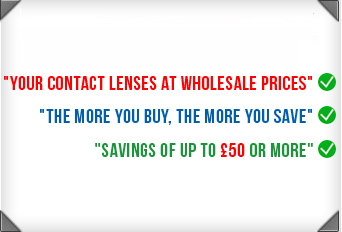 Call our contact lens team on 0800 037 4000 with any questions about our products or the order and delivery process. 98% of contact lenses are shipped on the same day you place an order.